ALL SUBMISSIONS MUST BE FILED ONLINE AT BRIDGESTONEREWARDS.COM OR RECEIVED NO LATER THAN MAY 16, 2019. OFFER EXCLUDES COSTCO AND BJ’S WHOLESALE PURCHASES. Reward will be fulfilled with a Bridgestone Visa Prepaid Card by mail. Limit 1 reward per each set of 4 tires purchased, limit 2 rewards per household, customer or address. Visa prepaid card may be used everywhere Visa debit cards are accepted. Certain limitations apply. See Cardholder Agreement. Not redeemable for cash. Please allow 10–12 weeks for the receipt of the prepaid card. Visit BridgestoneRewards.com or call (800) 926-3716 to check the status of your claim after 4 weeks. Invoice and claim form must be submitted for each eligible purchase. 1. Retail purchasers only. Offer excludes commercial, fleet and group purchases, employee changeovers, and warranty replacement purchases. Valid in the U.S. only. Void in PR and where prohibited. Must be 18 or over. No special orders or rain checks. Claim form required. Cannot be combined with any other offer. 2. Customer information collected herein is solely used by Bridgestone Americas Tire Operations, LLC (“Bridgestone”) for internal marketing purposes and for the administration of Offer, and to contact the consumer if we have express consent. Bridgestone and its agencies are not responsible for (a) late, lost, altered, forged, illegible/garbled, inaccessible, corrupted, defective, postage due or misdirected submissions regardless of cause, or (b) technological problems/malfunctions/failures of any kind. All decisions of Bridgestone are final. 3. Bridgestone Visa Prepaid Card issued by The Bancorp Bank pursuant to a license from Visa U.S.A. Inc. The Bancorp Bank; Member FDIC. The Prepaid Card is given to you as a reward or gift and no consideration, value or money has been paid by you for the card. 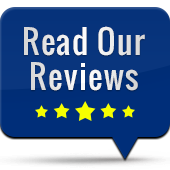 No cash access or recurring payments. Card valid for up to six months, unused funds forfeit at midnight EST the last day of the month of the valid thru date. Card terms and conditions apply; see BridgestoneRewards.com/CardTerms. All trademarks and brand names belong to their respective owners. Use of these trademarks and brand names do not represent endorsement by or association with this card program. All rights reserved. 4. 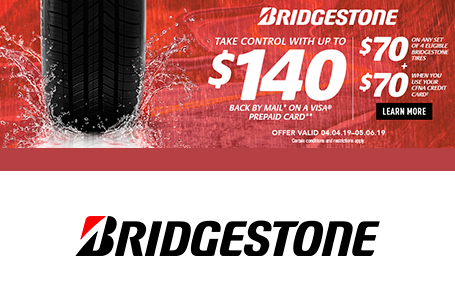 To receive the $140 Bridgestone Visa Prepaid Card by mail you must purchase a set of 4 eligible Bridgestone tires with your new or existing CFNA credit card account. The full 9-digit account number must be provided at time of submission. CFNA accounts subject to credit approval. The Bridgestone Visa Prepaid Card cannot be used to pay any credit card balance. The Bancorp Bank is not affiliated in any way with this credit card offer and does not endorse or sponsor this credit card offer. Participating retailers only.